Five years ago I received a present from my uncle Marco: an Arduino UNO; he knew my passion for computers and in the past he taught me how to write programs in Python. My first “success” was to be able to have a led blinking with scratch4arduino, then my father rigged a wood board with a breadboard, some switches and some relays (already equipped with the control transistors) and with these components I have learned to control leds, a loudspeaker, a small dc motor, a seven segment display and how to use different types of sensors. After a while (having left scratch and now writing programs directly in Arduino language) I build a two wheeled robot, one motor on each wheel, that I controlled by means of a Python program connected to Arduino via USB. Another project that I realized, tested and disassembled was an odometer for the bicycle: a lilypad board with an LCD and a magnetic sensor on the wheel of the bike measured and displayed the speed. When we installed photo-voltaic solar panels on our house, my father asked me if it was possible to build a device capable to measure the energy produced. I tried to analyzed the proprietary serial protocol of the inverter, but it was not easy to decode, so I decided to use the fact that a led on the counter blinked every time a W/h was produced; In now completing the device that counts the blinks and saves the data on an SD card, then an Ethernet shield creates a web page with the graph of the energy produced. Before starting to work on the Maker Faire project I was designing and prototyping a quadcopter using two Arduino boards (one as controller and one to manage the propeller motors). It is not finished yet because I faced the problem of the noise generated by the vibrations on the accelerometer. The idea of the Maker Faire project come to me when Google dedicated a doodle to Alan Turing. Reading on Wikipedia his story I’ve learned about the Enigma machine. This project was initially realized to be presented as final project of Middle School (junior high – seventh grade). 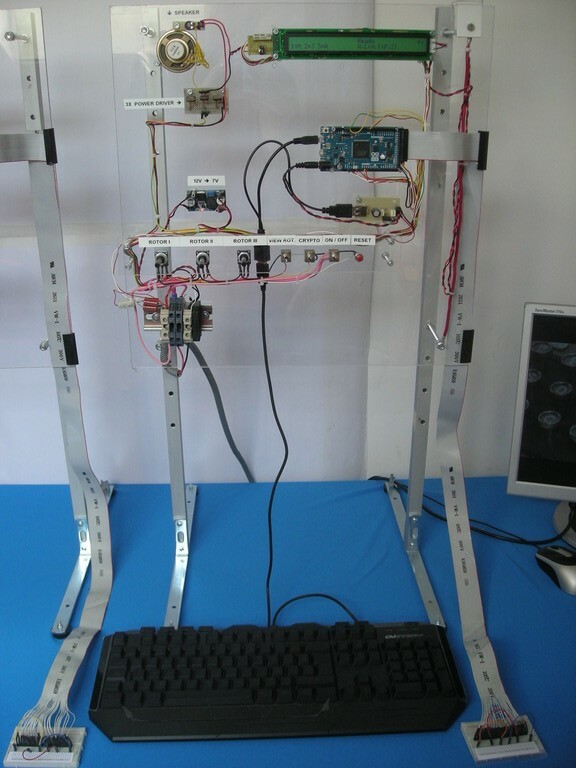 In the first version I used Xbee to transmit and cryptography was just a table substitution. 20 minutes before midnight of the last day available I subscribe to Maker Faire, but I was not fully satisfied with my first solution because I wanted to find another way to transmit the message. I tried simple optical transmission of morse code, but I faced the problem of background noise due to room lights, finally I managed to filter out the noise transmitting 1 KHz modulated pulses of light by means of three powerful 10 W leds. I also rewritten the encryption engine replicating the same process used by Enigma machine during World War II. I am very impressed with your Enigma project for Maker Faire 2013. It is quite an accomplishment for even advanced computer programmers and hardware enthusiasts, much less a middle school student. Have you published details of your Enigma software? I would be interested in studying it. 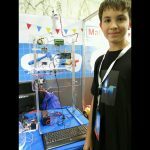 Congratulations on your success at Maker Faire. thank you for your esteem. The sketch for Arduino is already available on my website (http://lizzit.it/?page_id=231&lang=en). I uploaded a new version with many improvements today: now it controls a bigger LCD (2×40 or 4×20), moreover I have added the possibility of swapping letters as the original Enigma did (in the newer photos you can see the breadboard with the colored jumper wires used to swap letters) and finally I have fixed MANY bugs. I’m updating the photoes of the project and project details in these weeks (I’m going to show the Light Cryptalk at Biennale of Venice in September). 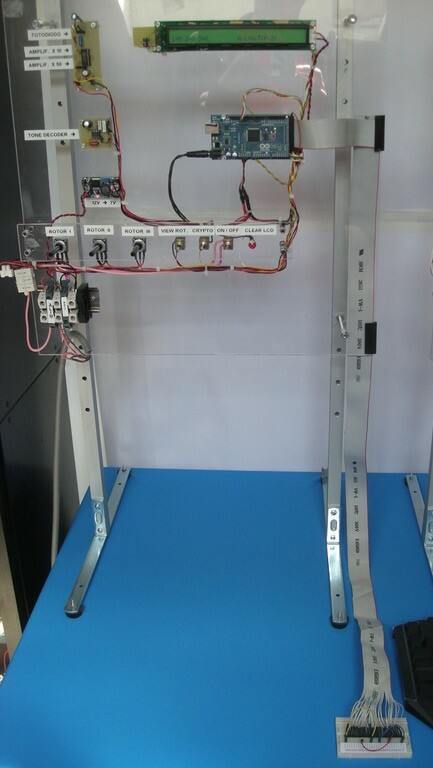 I also hope to add soon the wiring diagrams. If you need more details, don’t hesitate to write me and I’ll reply as soon as possible.